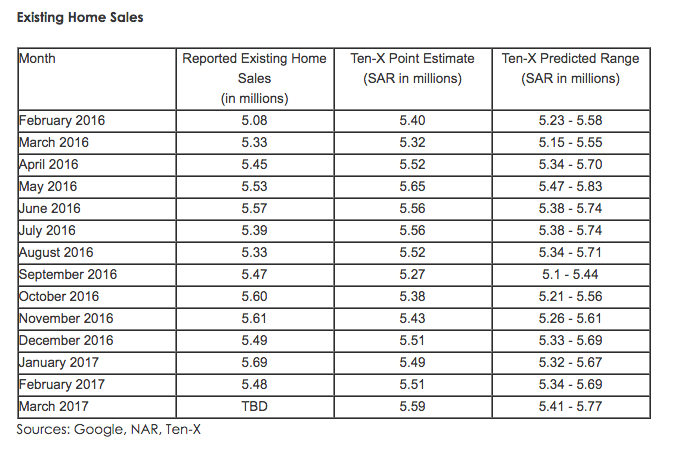 March sales will fall between seasonally adjusted annual rates of 5.41 – 5.77 million with a targeted number of 5.59 million, up 2.0 percent from NAR’s reported February sales and up 4.6 percent from a year ago. 30-year fixed-rate mortgage (FRM) averaged 4.14 percent with an average 0.5 point for the week ending March 30, 2017, down from last week when it averaged 4.23 percent. A year ago at this time, the 30-year FRM averaged 3.71 percent. 15-year FRM this week averaged 3.39 percent with an average 0.4 point, down from last week when it averaged 3.44 percent. A year ago at this time, the 15-year FRM averaged 2.98 percent. 5-year Treasury-indexed hybrid adjustable-rate mortgage (ARM) averaged 3.18 percent this week with an average 0.4 point, down from last week when it averaged 3.24 percent. A year ago, the 5-year ARM averaged 2.90 percent. 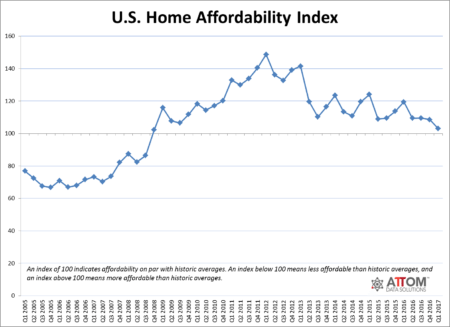 Nationally the affordability index in the first quarter of 2017 was 103, down from 108 in the previous quarter and down from 119 a year ago to the lowest level since Q4 2008 — a more than eight-year low. 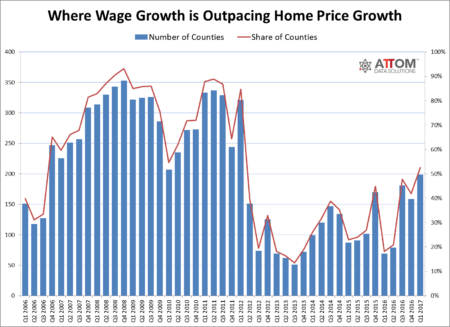 The index of 103 translates to 33.6 percent of average weekly wages needed to buy a median-priced home nationwide, below the historic average of 34.6 percent but the highest share of wages needed since Q4 2008, according to Attom Data Solutions. Maui County, Hawaii (100.2 percent). Milwaukee County, Wisconsin (14.8 percent). 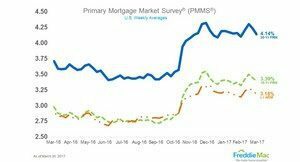 The Market Composite Index, a measure of mortgage loan application volume, decreased 0.8 percent on a seasonally adjusted basis from one week earlier. The refinance share of mortgage activity decreased to 44.0 percent of total applications, its lowest level since October 2008, from 45.1 percent the previous week. The FHA share of total applications decreased to 10.8 percent from 10.9 percent the week prior. The VA share of total applications increased to 11.0 percent from 10.1 percent the week prior. The USDA share of total applications increased to 1.0 percent from 0.9 percent the week prior. The average contract interest rate for 30-year fixed-rate mortgages with jumbo loan balances (greater than $424,100) decreased to 4.26 percent from 4.40 percent. The average contract interest rate for 30-year fixed-rate mortgages backed by the FHA decreased to 4.24 percent from 4.33 percent. The average contract interest rate for 15-year fixed-rate mortgages decreased to 3.57 percent from 3.68 percent. The average contract interest rate for 5/1 ARMs decreased to 3.30 percent from 3.41 percent. Retirement-aged homeowners saw a combined 2.8 percent increase of $170.7 billion in home equity in the fourth quarter of 2016, boosting their total housing wealth to $6.2 trillion. A 2.4 percent increase in home values for owners 62 and older in Q4 2016 drove the NRMLA/RiskSpan Reverse Mortgage Market Index (RMMI) to 221.75, an all-time high since the index was first published in 2000. On a year-over-year basis, the RMMI index rose by 9.0 percent in 2016, compared to an increase of 8.6 percent in 2015 and 8.0 percent in 2014. 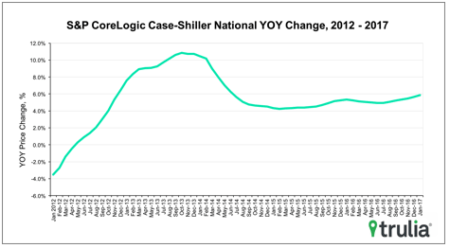 There is little sign of relief from high home prices as we enter the spring home buying season. The tough buying market is characterized by competition driven by low inventory and challenges for first-time home buyers as prices outpace income growth. 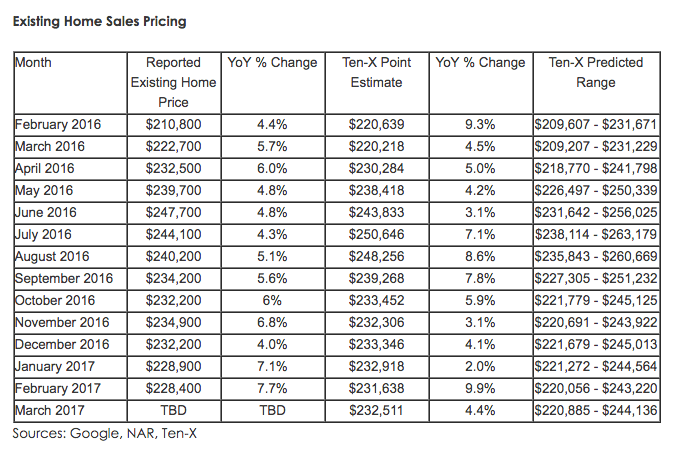 Hot markets remain hot: Denver, Portland, Ore., and Seattle reached their highest index values ever. Mortgage rates are lower than expected, so the anticipated cooling of home prices as a result of higher rates is likely delayed. Spring homebuyers will be eager to lock in rates that remain low. The national housing market continued its rally in the fourth quarter of 2016. On an annualized basis, 5,810,000 sales transactions were reported, which is up 350,000 transactions, or 6.4 percent, from 2015. 2015 had already seen demand grow by 340,000 transactions or 7.6 percent from 2014. The home purchase market also closed out 2016 with strong growth as transactions increased 9.1 percent in the fourth quarter compared to a year ago. Cash sales continued to trend down accounting for only 29 percent of all transactions in 2016, down from 30 percent in 2015 and 36 percent in 2013. Filling its void was government-backed lending, which accounted for 55 percent of all transactions in 2016, up from 53 percent in 2015 and 50 percent in 2013. 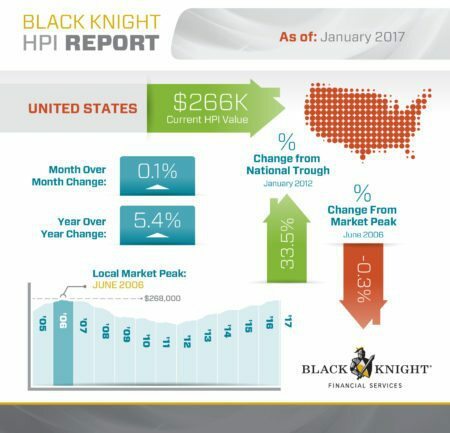 The AEI/First American National Housing Market Index (NHMI) is the first index to report on the entire home purchase market. Transaction numbers are also available on the state and metro area level for unprecedented geographical detail. Purchase mortgage demand growth over the prior three months has steadily declined for all loan types, when compared with Q1 2016 and Q1 2015, reaching the lowest reading for any first quarter since Q1 2014. The near-term outlook showed a similar trend, with the net share expecting increased demand over the next three months declining to the lowest level for any first quarter since the survey’s inception in Q1 2014. For refinance mortgages, the net share of lenders reporting rising demand over the prior three months fell to the lowest level since Q1 2014. On net, lenders reporting demand growth expectations for the next three months rose from survey lows last quarter (Q4 2016). Lenders continued to report modest net easing of credit standards across all loan types for the prior three months and continued to report expectations to modestly ease credit standards over the next three months, with the majority of lenders expecting their credit standards to stay about the same. On net, lenders continued reporting expectations to grow GSE (Fannie Mae and Freddie Mac) and Ginnie Mae shares and reduce portfolio retention and whole loan sales shares, although to a lesser extent. This quarter, slightly more lenders reported expectations to increase rather than decrease their share of MSR sold and to decrease rather than increase the share of MSR retained that is serviced by a sub-servicer. 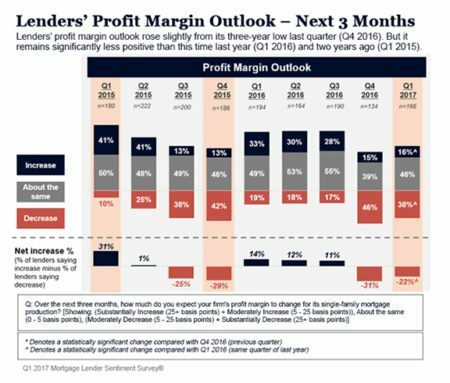 The majority of lenders continue reporting expectations to maintain their MSR execution strategy.